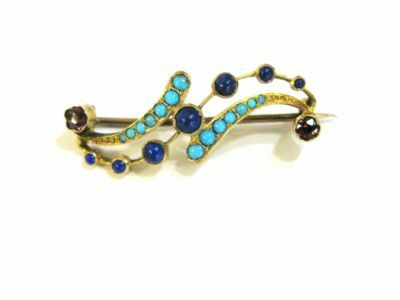 A beautiful 14kt yellow gold Victorian brooch with 7 round cabochon lapis lazuli , approx 1.4mm - 3.3mm; 14 round cabochon turquose, approx. 1.00 - 2.00mm and 2 round facetted cut medium pink tourmalines, est. 0.27ct.